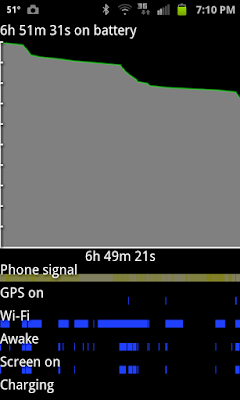 All Android phones get complaints about battery life. You'll remember that I even returned my first Captivate due to battery life. After a little over a year I was about to buy a new battery for the Captivate. Then I dropped it. That story is here and ends with installing Gingerbread. Part of the screen repair process was a factory reset so Gingerbread started with a clean slate. 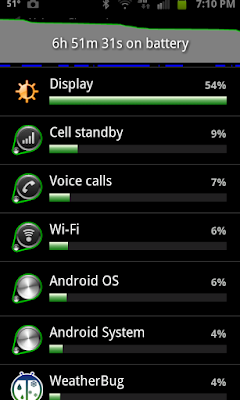 However I've been amazed with the battery life post the repair and upgrade. I didn't return the battery to the Samsung service center so I know they didn't slip me a new battery. 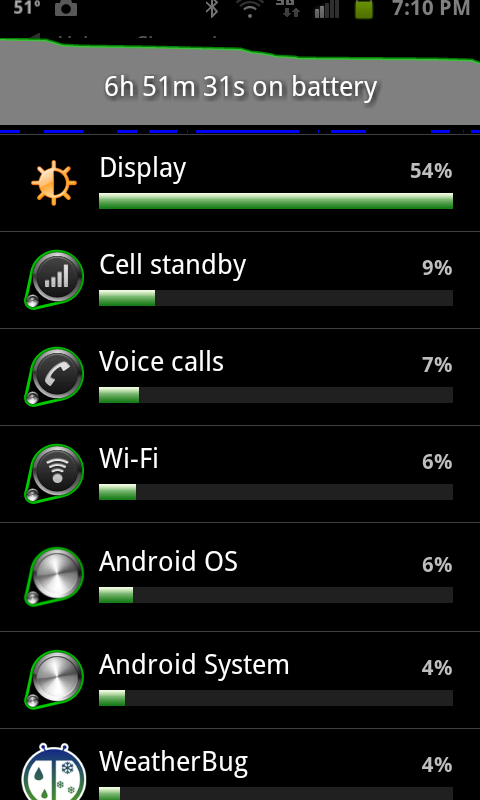 Admittedly I've been pretty light usage since the upgrade but still. Here's a series of screen shots taken each night when I plug it in for the night. The lowest reading during those seven days was 67% remaining. I personally don't think that Gingerbread is responsible for the majority of the improvement. 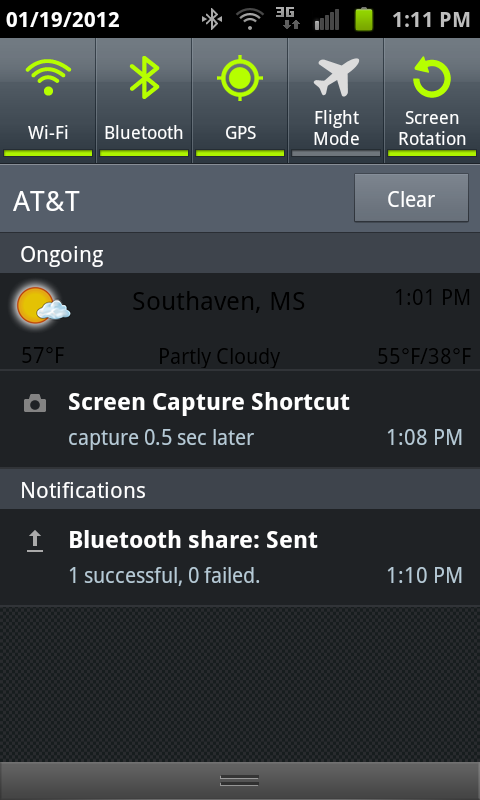 I think that the factory reset and the resulting clean-up had the biggest impact. Anybody who's been following me here knows I have a bias toward ThinkPads. I had been using an off-lease T43 for a while but it started off (for me) with a pinky display and wouldn't run Windows 7 Aero. Over the Black Friday weekend I lurked at the Lenovo Outlet site. They had some incredible deals but they came and went pretty quick. One of the deals that caught my eye was a T420s. I grabbed it and put it in my shopping cart but thought better and removed it. It immediately disappeared! That told me that it was a good deal. I hung around there a while longer pressing F5 every few seconds and it came back! This time I didn't hesitate. I bought it and then started trying to figure out what I'd bought. What it was was a 3.7 lb. (the "s" in T420s stands for "slim") Intel Core i5-2540M (2.6GHz) with Windows 7 Pro. It came with 4GB RAM (which I'll upgrade to 8GB) and a 128GB SSD. It has a 14" screen (1600 x 900) and a 720p web cam. It's got a DVD burner and Bluetooth in addition to the expected Gigabit Ethernet and 802.11n wireless. 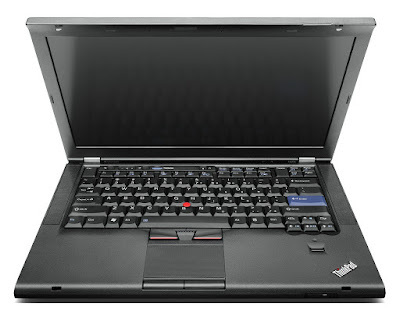 Being a "T" series it was mostly clean of crapware so my first inclination was to just go with the Lenovo image. But after a couple of days I began to notice that I was using 80% of real memory and had almost 120 processes running. That compares to the X100e that uses less than 50% of 2GB and has less than 50 processes running. I'm not sure that's apples to apples but it certainly is an indicator. Recently I did a clean install of Windows 7 Pro using Lenovo's instructions. I tried to do this using the UEFI feature as described here but it doesn't look like that worked. Regardless the T420s is a lot cleaner now. It's under 80 processes and less than 50% memory utilized. One of my co-workers came into the office after the holidays with a shiny new Samsung Galaxy S II. As we sat around the table after our meeting I noticed that he had the phone USB connected to his laptop. His previous phone (HTC G1) always needed charging so I asked him if he was charging the new one out of habit. He said no that he was trying to connect the phone to the laptop but couldn't find a driver. 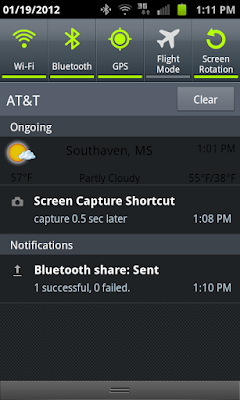 My experience with every smart phone except iPhones is that you didn't need a driver to connect the phone to a PC as a USB drive. He wanted me to show him how I connected so he brought me his USB cable and phone. When I plugged it all in I got a complaint from Windows that it was an "Unrecognized device." Hmmm. Then I plugged my Captivate in with his cable. Same thing. That invoked the "Those are standard aren't they?" Well they should be but they aren't. I recently encountered a similar problem when the OEM charging cable for my Captivate got stepped on. I ordered the first $.99 micro-USB cable I could find. It fit fine into the tight connector on my Captivate and the battery icon changed to charging. 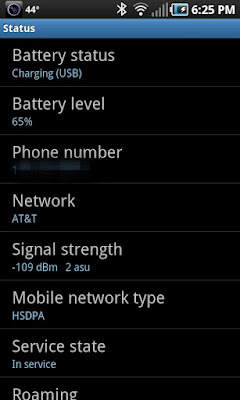 But the next morning the battery was only at 70%. Here's what the charging screen looks like connected to the generic cable. Notice that it says "Charging(USB)." 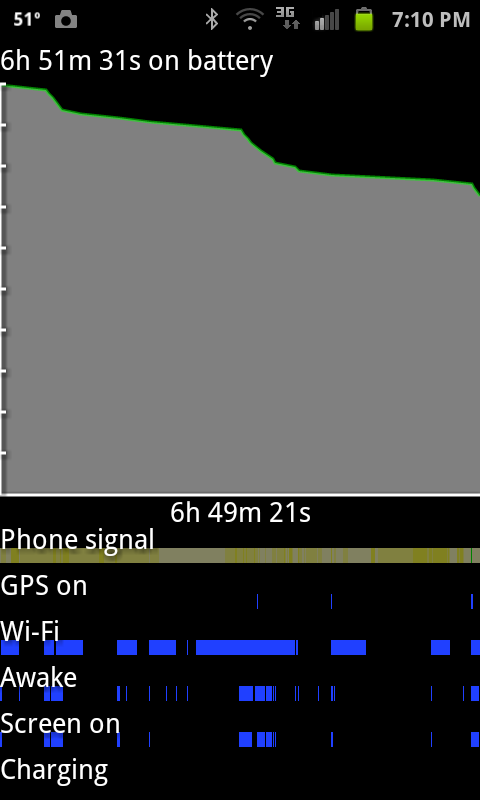 That's why it was taking so long to charge. Back to Google and I found a Samsung OEM charging cable on eBay. It came quickly and fixed the problem. Here's what it looks like connected with the Samsung cable. 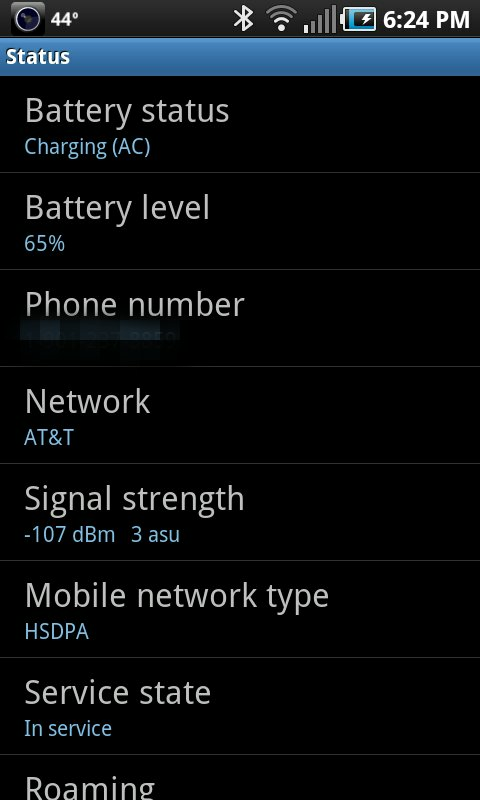 Notice that it says "Charging(AC)." Yeah, USB cables should be standard but obviously they aren't.